This might be indicative of the dichotomy between the desires of individual party members and the ideologies of those who lead the parties further and further to their extremes. It could also mean that many Democrats and Republicans want to see a new party in the hopes that it weakens the base of the opposing party. Whatever the reason, it should be clear that the path is opening up for new ideas to enter politics. Of course this is also indicative of the attitude expressed by those polled earlier this year when they declared that the founding fathers would be disappointed in the state of the nation today. Yet, while it is great that Americans feel this way, it would be even better if they would actually vote as they felt. With all votes for alternative party candidates for President coming in at less than 3% of the total votes cast for president in the last election, we find that the stranglehold the duopoly parties hold on the mind of voters is still strong. Hopefully, with all the issues facing the nation lately and the harsh fighting among those in office, we can see a change for the better in the coming elections. With all this said, it will not be easy for new parties to rise up. There are still plenty of hurdles put into place by the duopoly parties that prevent them from gaining traction. Whether it is the duopoly parties colluding to exclude qualified third party challengers from debates, or new laws being written to make it harder for new parties to gain and keep qualified status or any other trick the duopoly parties use, it is clear they will not stand idly by and let a new party rise up and challenge their hold on power. Here in Oklahoma, we have one of the toughest laws in the US regarding the formation of new parties and the Republican controlled Legislature is doing everything it can to keep it that way. But as those voters who truly want to see new parties in Oklahoma and the US band together and pressure lawmakers to make the much needed reforms, we can have better representation from those whom we elect. Please write or call your State Representative and Senator and ask them to support real Ballot Access Reform. 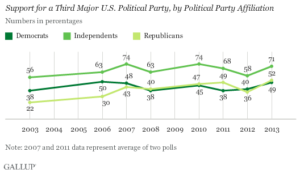 This entry was posted in Political Parties and tagged Alternative Parties, Gallup Poll. Bookmark the permalink.